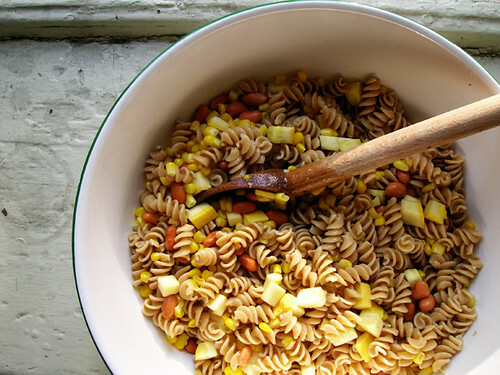 No Grandpa Simpsons were harmed in the making of this pasta salad. Put some water on for the pasta. Measure vinegar into a large bowl. Add generous amount of salt and pepper. Drizzle the olive oil over the vinegar and whisk it in. Trim and dice the summer squash and toss in the vinaigrette. Cook the pasta according to package directions, about ten minutes or until al dente. Just before the pasta is done, throw the corn into the pot and bring back to a boil before draining. Meanwhile rinse and drain the pinto beans, and toss them with the zucchini. When the pasta is done, drain and toss with everything else. THIS IS SPARTY'S Hawaiian Smoothie!! !